Many people love the holidays for different reasons. Christmas means family, friends, giving and receiving. Here in Colorado its usually around when our skiing gets pretty good and things tend to quiet down as students are off of classes and folks get a few days away from their jobs to spend time with those who matter. For many, the best time about the Holidays in New Years Eve. No matter what your up to, it needs to be exceptional. In Colorado, New Years usually means great music. There are so many options since we have countless quality musicians and bands that love to party the night away as much as we do. Something a bit out of the ordinary changed the usual NYE music mix last Monday. String Cheese Incident announced a New Years Ever run. Three days, 1st Bank Center, home turf. This was especially significant since surprisingly the Incident had never performed a Boulder/Denver area celebration on December 31st. For a band whose roots are deeply wound in the Front Range, it was a shocking reminder that this was indeed the first time ever for the Incident and a hometown New Years Eve. Anyone that’s been to a String Cheese Incident can tell you that it’s more than just the music. It’s the most eclectic and enthusiastic crowd out there, and at the same time the most welcoming and diverse. The band is surrounded by various entities and organizations promoting social and environment awareness. But never had Michael Travis, Jason Hann, Keith Moseley, Bill Nershi, Micahel Kang and Kyle Hollingsworth ever attempted the feet of a Front Range New Years Eve. It’s hard to say why. Maybe anticipation would have been too high and they didn’t want to do it until they had a time and place where it was logistically possible for everybody. Maybe it was just a weird coincidence. Regardless fans were overjoyed at the announcement and the show sold out sometime in October. And after everybody had a quiet Christmas and spent that family time, it was time to get together with their second family. Though the show was sold out, the good thing about 1st Bank Center is that it’s truly the perfect size and capacity to host that hometown crowd. Anything in Boulder would have been too small. The worst part about sold-out shows is if everyone is crammed in like sardines with no dancing or breathing room. So 1st Bank was certainly a smart choice as getting through security and the door never seemed like a lengthy ordeal. Event staff was generally pleasant and knowledgeable about getting around. 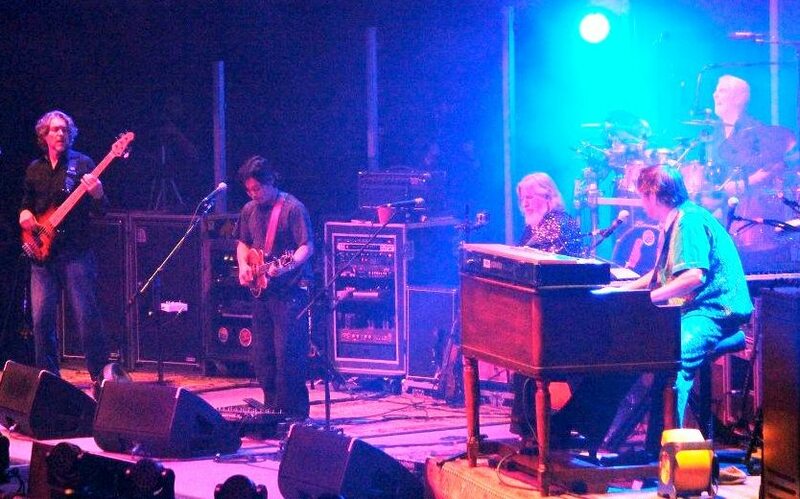 When show time came, I recalled that usually String Cheese Incident plays a solid three-set New Years Eve. Time to get crazy. The band arrived onstage a little after 8, as they had the previous two nights. Guitarist Bill Nershi gave a grand group-whoot before launching into the Jean Luc Ponty cover of “Mouna Bowa”. The song has been one of their party numbers since the late 90s and everyone couldn’t have been more thrilled with the choice of opener. It’s a chance for Billy to pick some solid scales, for fiddle-man Michael Kang to show his greatest attributes, and bassist Keith Moseley to thump some floor shaking bass notes. It’s really the quintessential Cheese rearrangement. 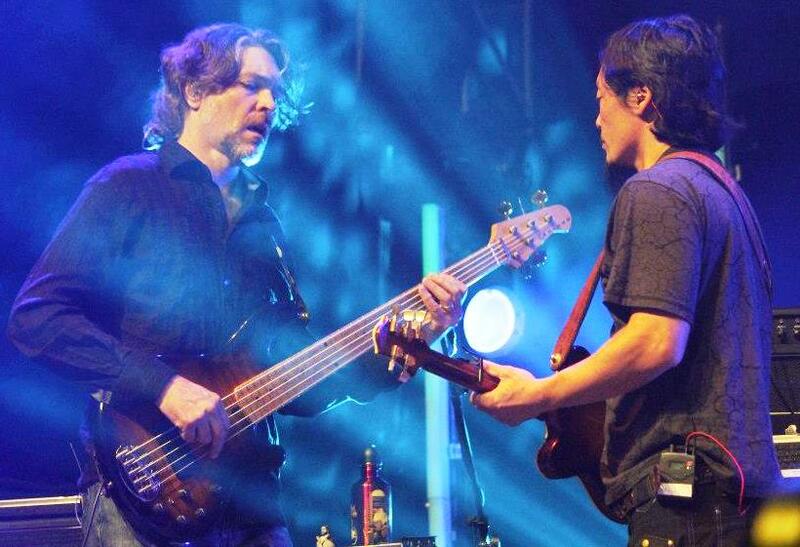 As they played the final notes of “Mouna Bowa,” Billy walked over to Kang for a familiar introductory solo. “Shine” is another familiar bust-out that as a follow up to the well-received opener had folks grooving and shaking. It’s sung brilliantly by Kang and inspires its listener to “let their love light shine.” A familiar message is often forgotten in the everyday strains of life and Cheese brings the feeling and really did radiate that vibe. The lengthy instrumental sections that extend “Shine” to well over fifteen minutes crash down into a climactic choral chant “Shine Your Light!” It was quite the bold start highlighting the potential surprises to come around the corner. Other highlights from the first set included Keith’s “Can’t Stop Now” a jaunty rocker from way back, Billy’s “Song in My Head” seems to be getting more steam as the guys work out some interesting psychedelic exchanges and bring the song to full fruition. I know I’ve talked about so many “favorites” but I really do adore “Restless Wind” as one of their strongest studio cuts. Keith’s vocal work is at times the band’s strongest and his heavy contributions the opening set made it feel like old String Cheese. Since the Incident was working within the three set framework, set breaks were pretty quick, giving the guys and crowd just enough time to take that short break. The second set continued to build some real momentum. “Miss Brown’s Teahouse” had some unusual playfulness that seemed drastically different to what I was used to hearing out of the song. Nonetheless Cheese really does strive to vary up particular arrangements from tour-to-tour and their hard work was certainly noticed. “How Mountain Girls Can Love” is an old-school grassy lament about chivalry in the hills. The Keller Williams collaboration “Best Feeling” (regrettably with Keller absent) got an uproarious nod from 1st Bank and as if it couldn’t have gotten better they played it into the reggae meets calypso rocker “Search”. A night full of old classics no doubt. Skeptics who talk about how much the band has changed their sound and so on should have been there for this run, as that notion may have been squandered. Another strong new song “Rosie” closed the second set. Though it may not have built in much variation to their general sound, it seems to be a worthy addition to the catalogue. Even the newer material melded well with old that notion became unimportant. Set break time and its 11:05. Anticipation starts to mount. What will the big moment be? Things were kept majorly hush-hush as nobody seemed to really know what the New Years Eve production was going to happen. One thing we did know was that as our tickets were scanned at the entrance, everyone was given a strange souvenir SCI bracelet with some ambiguity as to its functionality or exactly why we needed it. Everything was to be revealed shortly. I left my many compadres on the floor at about 11:53 right after the band came to start set three with “Let’s Go Outside”. The stands were certainly the right vantage point to capture the mayhem that was about to ensue. As I walked up a stairway into the stands, security folks asked me to shuffle to the side. 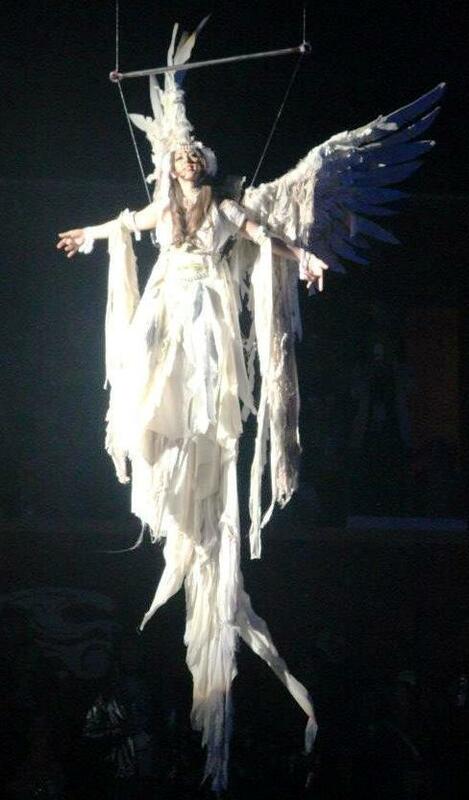 I looked up the isle to see a stilted, white-gowned angel moments away from making a grand entrance to the floor. 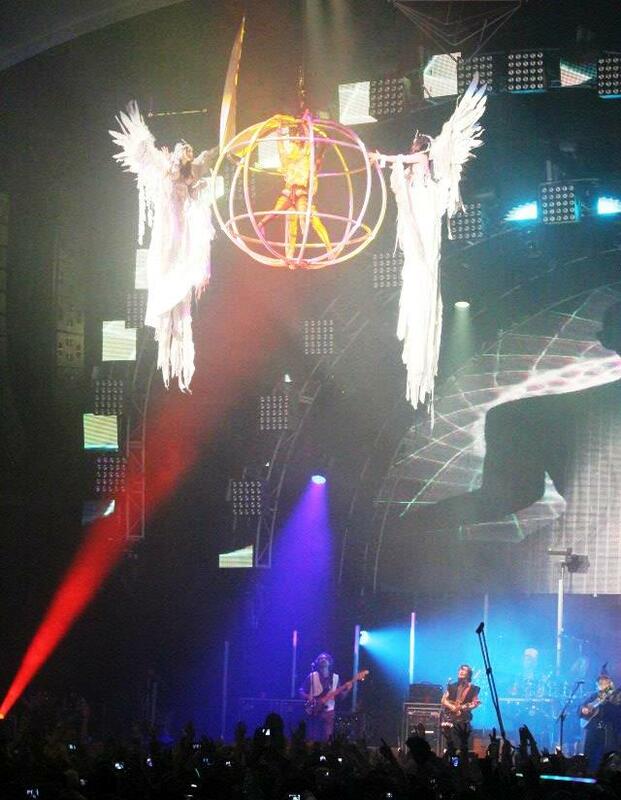 I peered around the arena to see other white robed goddesses in sectioned-off dance spaces. The band ended the first song and broke out an old favorite. Their friend and fellow Coloradan Tim O’Brien’s original “Land’s End.” This would set the stage for the big moment. Slowly the production revealed itself, extensively choreographed and involved, trapeze artists descended from above rafters, dressed in gown and glistening in the light show from stage. The crowd was in awe. I have been to quite a handful of New Years Eve events and never have I witnessed anything of this caliber. A golden globe drops from the ceiling with two bronzed ironclad beauties spinning around as part of the sphere. The band was as in awe as the crowd, playing their hearts out and viewing the production from stage must have been a moment of immense satisfaction from a ton of hard work and coordinating. The organization really did go above and beyond. As more gorgeously dressed Cirque du Soleil inspired goddesses walked onstage a strange metal prism on wires dropped to the stage and the acrobats climbed upon it and were hoisted into the sky about the crowd, aligning with the various other performers already up above. Then finally, the big screen onstage began a fifteen second countdown as the purpose of the crowd’s bracelets was revealed. Multicolored lights illuminated from each individual bracelet controlled by lighting design personnel. It was a wild addition to everything else going on. As 2012 turned into 2013 a jovial plump fellow suspended on wires appeared hovering above stage, a stark contrast to the beautiful all-female acrobat assembly. Ribbons, balloons, lights, noisemakers, all of the usual NYE fare accompanied the extraordinary other steps that the band put into the big moment. The crowd rejoiced, kissed their loved ones, and began to take in the mayhem they just witnessed. No expense was spared in the grand New Years affair. It was a true testament to the band’s mission of always upping the anti and surprising their fans. I’m sure at that moment, there wasn’t anybody in house who wished for another place to be. Next, Billy addressed the crowd. He began talking about his first experience rolling into Colorado from New Jersey and how he gazed up at the sky and was in awe. Appropriately, the band played “Colorado Bluebird Sky,” another newer song that fit the occasion perfectly. Things got a little nit-grit next with “Bumpin’ Real,” another Kang Fiddle electro-fusion jammer that always gets best dancers in the crowd going. The third set closed with a great big jam sandwich. Another Kang/John Perry Barlow collaboration and crowd favorite “Desert Dawn” played in and out of Aerosmith’s “Sweet Emotion”. I was shocked to hear the Aerosmith classic played in that arrangement (usually for Aerosmith covers it’s “Walk This Way,”) but that’s was they’re best at, defying expectations. In a year of so much heaviness and speculation about the end of the world and such, it was great to be brought back home by our hometown boys. Since seeing them collectively is harder than it used to be, it seems to bring together a family reunion of sorts whenever they do. The production that SCI put on this last Holliday weekend was guaranteed unmatched by anything else going on in Colorado, perhaps even nationwide. Every night was a completely different feeling and another chunk of their huge catalogue of songs arranged opposite of what you would expect. No one can really describe a String Cheese Incident unless you experience it personally. These last shows were a testament to their devotion to their music and their fans. The future is uncertain as no dates are announced for the collective band. I have a feeling summer might bring us all back together again. For now, Happy New Year. Thanks for joining Grateful Web for full coverage on the whole big event. And a big major thanks to everyone in the organization for their above-and-beyond commitment to always keeping it crazier than we could have ever imagined. 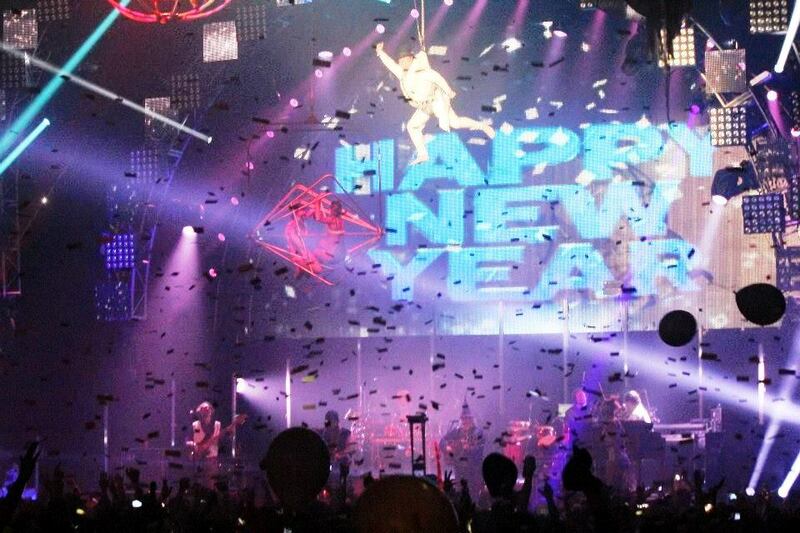 Check out more photos from Cheese's New Years show.